An estimated 7,000 properties around England and Wales will be sacrificed to rising seas over the next century, according to the Environment Agency. Analysis by the Agency, based on current funding levels, projects that more than 800 will be lost over the next 20 years as coastlines erode. The cost of protecting these properties is considered to be too high. The Environment Agency estimates that more than £1bn worth of properties will disappear as a result. 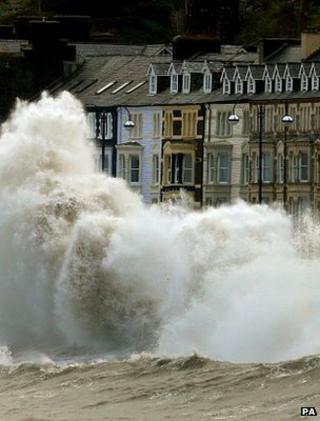 The coast of England and Wales is being steadily eaten by the waves, and climate change is projected to increase sea-level and drive up the intensity of storms. In the coming 100 years, six local authorities - Great Yarmouth, Southampton, Cornwall, North Norfolk, East Riding and Scarborough - are expected to lose more than 200 homes each. Local groups are campaigning for compensation if they are forced out of their homes. The government has resisted this call, which could set a precedent for paying damages to people affected by climate change. Friends of the Earth has accused the government of dumping the costs of climate change on to vulnerable people. An Environment Agency spokesperson told BBC News: "The recent announcement of £2.3bn investment over the next six years will see significant investment in coastal flood and erosion risk management, with 15,000 properties better protected from coastal erosion over the next six years. "The Environment Agency uses a range of advanced techniques to monitor and assess the causes and impacts of coastal erosion," they explained. "We work with local authorities, which lead on shoreline management plans, to identify erosion risk management schemes, coastal erosion monitoring and further research on how we best adapt to these changes." The Agency said the estimates of flood damage were calculated as part of a routine exercise and had not been previously published. The properties expected to be lost include 3,453 homes and 3,216 non-residential properties, including businesses. The Agency has been told by government to prioritise flood defences in areas in heavily populated areas. This is why agricultural land on the Somerset Levels was allowed to flood last winter.